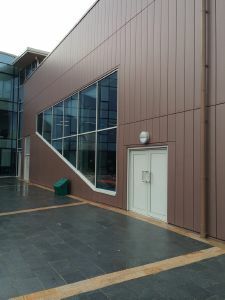 The reveal panel is probably the most popular cladding system for traditional metals such as copper, brass, bronze, zinc, stainless steel or precoated aluminium. Panels can be installed horizontally, vertically or diagonally and can be manufactured in various widths / shadow gap combinations. The reveal panel is also highly effective for use as a soffit system. The installation is straight forward, one panel interlocking into the next with a concealed fixing. We offer a complete fabrication service, together with all system components & accessories.